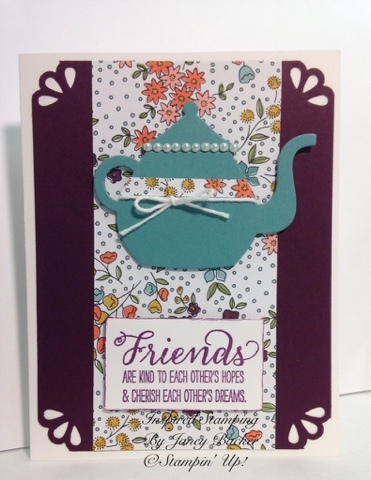 This design is very feminine and fun as option #4 of the Tea Party Invitation series. I love Blackberry Bliss, the color is so rich and I love summertime blackberries! The Lost Lagoon tea pot is so sweet wrapped with a stripe of flowers and ribbon. But the pearls add the elegance of a formal high tea party. This Wildflower Fields Designer Series Paper ties together so many pretty colors and is available free during Sale-a-bration with a $50 order. 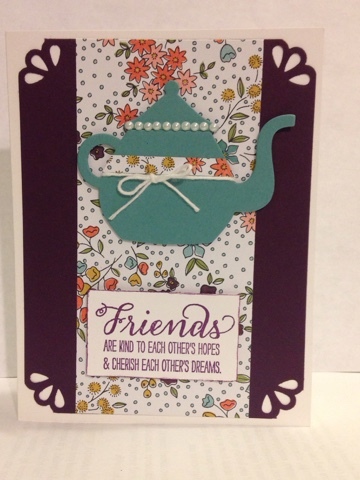 Cups and Kettles is a thinlit set in the 2016 Occasions catalog. This tea pot is the perfect traditional shape. I love tea time and a good pot is necessary for for tasty tea. The curvy trio punch adds another touch of elegance on the corners. All of the supplies are listed below and will link you to my online store. You can use these tools, papers and ink to make your own creative designs. Thank you for visiting. You can follow along as a subscriber, sign up along the right hand side. I love your comments, please let me know what you think of this series!